In addition to classes, the club hosts a number of Special Interest Groups which meet in the clubroom. These include a Digital Photography Group, a Technical Group, a Video Editing Group and a Web Design Group. The only group with a waiting list is Monday's Technical Group due to space restrictions. An important feature of this new site is that it is designed to be "responsive" which means that it has a consistent appearance using all popular browsers on devices ranging in size from the smallest smart phone to large smart TVs. 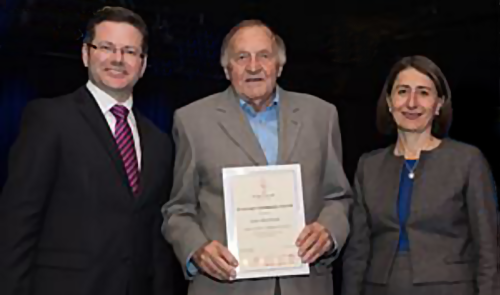 Congratulations to John Shortland for the 2018 St George Community award he recently received from the Premier, Gladys Berejiklian, and the Member for Oatley, Mark Coure, in recognition of his community service through the Hurstville Seniors Computer Club. 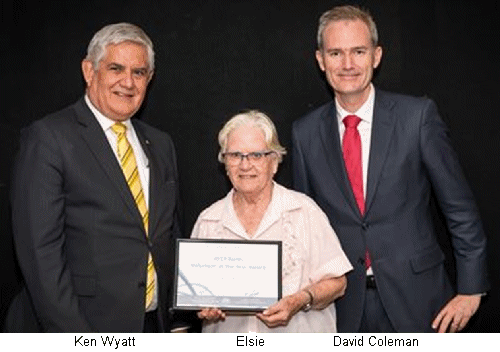 Congratulations also to Elsie Elliott for the 2019 Banks Volunteer Award received from David Coleman (Federal Minister for Immigration, Citizenship and Multicultural Affairs and Member for Banks) and Ken Wyatt AM (Federal Minister for Aged Care and Indigenous Health). Elsie is a foundation member of the Hurstville Seniors Computer Club and has been a very active volunteer for the club over the past 21 years. Jonathon James from NBN Co will talk about the network rollout and how it will be connected to your home. At our October 2017 DIG meeting, members presented "Parallel Lines" photos. While Club activities are scheduled on Mondays to Fridays, the best times to call into 91 Queens Rd, Hurstville, to book courses or pay membership fees are on Tuesdays, Wednesdays and Thursdays from 9:30 am to 12:00 noon, during school terms.